This story, however, reveals a deeper level of our personal family intrigue and one far less rosy. Let me preface any further statements by saying my Father was a much-loved man. My friends often dropped into my place regardless of whether I was there or not. Engaging “Flash” (short for the “Freddy The Flash” nick Eastern Illinois newspapers labeled this excellent football player with, and a sobriquet irresistible to my little vandal friends) was just too tempting to let go by. His big goofy full smile was the reward they waited for and he never failed them – not a once. He would grab a deck of Rook or Hearts cards and they’d get busy, sharing space and time. He is still my hero and I miss him dreadfully, each and every day. This is a “guest post” – a first in this blog. As the “About” section implied, my move to Louisville has long since transpired and I have lived with my Mother and younger brother for the past 3 plus years. Mother is now 94 – a couple months from 95 – and she has taken a few tumbles and challenged the resourcefulness of her younger charges in keeping her active and alert. That may have been the easiest part, actually, come to think of it. On July 16, my 94-year-old mother finished talking to my brother, turned, and fell down hard, banging her head on the corner of his chest of drawers. Her skull and brain were fine, but she broke her neck in two places. My brothers Steve and Tom live with her. Steve told me that I couldn’t talk to her because she was so doped up to control the pain that she didn’t know where she was. When a sweet spot emerged for medication that blunted her pain but left her conscious, I decided to go back to Louisville and have the Final Conversation with her. We talk once a week, but we both like to look ahead, so we’re always talking about what the kids are doing and whether the Cardinals will go to the World Series. She’s been written off several times before, most recently when she fell and broke her hip, but her bones heal quickly, and she always bounces back. I decide not to count on that, and go tell her what I really felt about her, and ask any lingering questions, like….why did we never go visit dad’s parents when we went to Illinois to visit mom’s parents? And, if she rallies yet again, we can pick right up with our weekly updates. 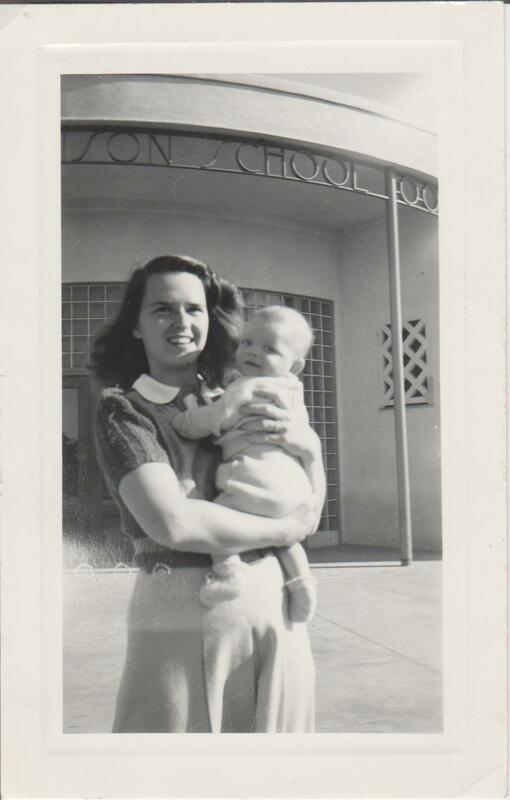 Here she is, a model at Marshall Fields in Chicago whisked away to San Diego at the beginning of World War II, holding me and looking ahead with an open, happy expression. 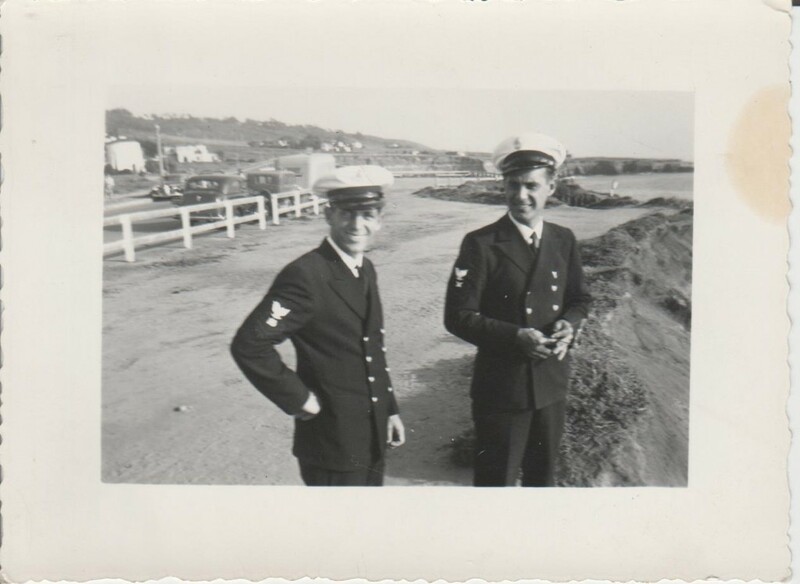 And here is dad, being admired in his navy blues. 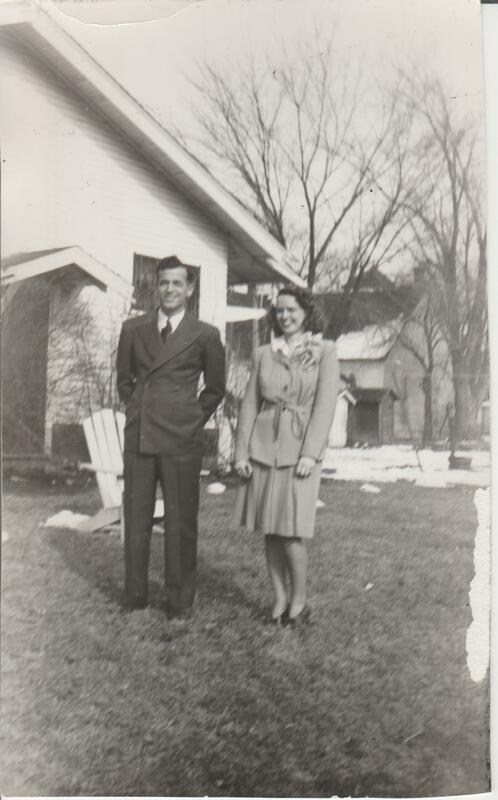 Here are my parents outside granddad’s house on their wedding day, February 12, 1942. Granddad and grandma’s house was the center of the universe. Here is a picture of my sister Diane and I cross-dressing in the front yard. Humboldt was an anything-goes kind of town for us. Granddad was the mail carrier and drove a 52-mile grid through neighboring farms, six days a week from 1917 to 1962. 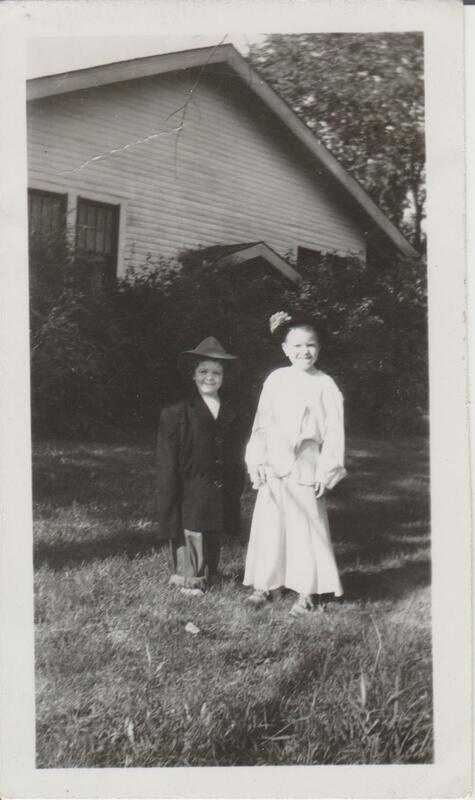 He was off work by noon, and would take me around with him after a big lunch, across the railroad tracks to the grain elevator, and into the railway station where serious men tapped out messages in Morse code. Then, we would visit the men lounging round the DX station on highway 45, and buy cokes. Everyone would look at the bottom of the bottle to see where it came from. Mostly they were from Mattoon, ten miles away. Occasionally Champaign Urbana, or Chicago. Once, I got one from Denver Colorado, and I was noisily celebrated. Then we went over to see Clint the barber, whose shop was the best-smelling place I’d ever sniffed, and over to spend time with the wastrels hanging out behind the post office playing washers. They would always let me throw in for a game or two. In the evenings, granddad and I would watch the freight trains and count the cars and wave to the caboose, and see the City of Miami and City of New Orleans whoosh by…All in all, as Tom Sawyer might say; it was miles better than anything else. One time, and one time only, we drove up to Homer to visit my dad’s dad Fred Sr., along with stepmother Ru, and Lester, the most disconcerting, intriguing sight of my childhood. Lester was genetically deformed and large. He emitted loud barbaric yawps but could not talk. He was tied by his ankle to a post, with a rope that gave him about a 15-foot circle to roam in. He was a good boy, Ru explained, but when he got too happy, he would bang into people and if he felt bad, he would throw himself down and around….Lester knew nothing about body boundaries, his or anyone else’s, that was clear. I slowly approached him, and shook his hand. The visit unfolded, my other granddad hesitant, with a glazed look and none of the ease and grace of my first granddad, and Ru, with exaggerated nods and shakes of the head and untimely, braying laughter…I stayed in the family circle watching and listening, better behaved than usual, one eye always on Lester. My father’s father had been a maker/repairer of buggies and buggy whips in Greenwood, Mississippi, until technology finished off that line of work. He moved to Marshall, Illinois. Dad’s mother died when he was very young. Sometime later, his dad came home with Ru and her son Hank. Hank and Ru moved right in. They didn’t like dad or his older sister Reba, and dad and Reba did not like them. One day his father told the two kids that he was thinking of marrying Ru, and said that they could decide whether or not he should go through with it. They voted against it, but he married Ru anyway. It started one day when Hank did something wrong and blamed dad for it. Ru whipped him, and when the same thing happened again, she got a buggy whip, and whipped him again, and again, and again. Reba made desultory efforts to help, but could do nothing. His father never intervened. Dad would leave the house for days and weeks at a time. Sometimes he would travel, sometimes he would go stay with neighbors. Mom met a woman from Marshall when she worked in Springfield, the state capitol, who told her that dad would come and stay with her family sometimes, that it was “unthinkable” what Ru was doing to him. In New Orleans, dad’s doctor asked mom if dad had been a Prisoner of War. Hank, meanwhile, was always getting in trouble. He dropped out of school and drifted away. Once, he came back home with a baby. He asked his mother to watch it for a couple of days. The baby was Lester. Hank never came back, and Ru spent the next 30 years taking care of Lester, until he died. 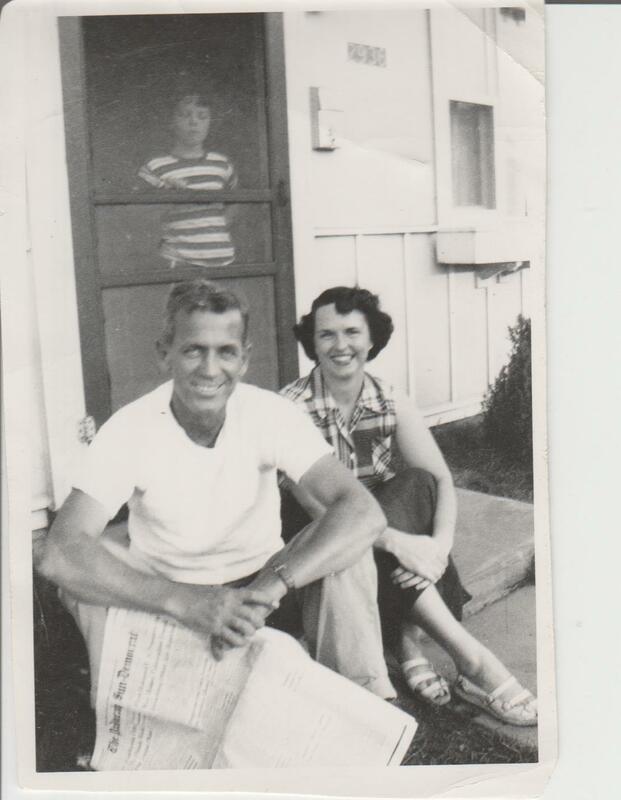 Here’s a picture of mom and dad in the early 50’s, riding the “trentes glorieuse,” or thirty-year wave of prosperity that washed over the Western World from 1945 to 1975, looking relaxed and confident in Paducah, Kentucky, where dad supervised the building of a subdivision for workers at the new nuclear processing plant. I was a difficult child because I determined around age 11 or 12 that I would go and seek my fortune, beginning in either New York or California, or perhaps Chile or China…I went through the motions of being an ordinary teenager, but my soul was already gone. I left home in 1960 and did not reconnect with my parents until 1980 – just in time, because dad died of lung cancer in 1983. I told mom that without her warmth and steady devotion I would be nothing, but she waved me off, and we resumed working on her Kindle word game, nailing down Level Nine. She no longer walks for miles every day like she did into her late 80’s. She reads a book every day now, sitting in her chair — Robert Patterson thrillers, a biography of Nikolas Tesla, anything at all. She’s always been weak for narrative, and is swallowing whole two east Louisville branch libraries. Stendhal in the early 1840s became fat and suffered from gout and other ailments. “Staying alive is troublesome and exhausting,” he said, “and I would gladly give it up, but I need to know how things will turn out.” Mom’s deep desire to see how the stories around her unfold will keep her going for God only knows how long. The broken neck is already fading into the past, no more than a bump in the road. When I arrived in Louisville a week ago she was disoriented, delirious with pain. Now, her bones have fused as they should. Physical therapists are working out her badly faded muscles twice a day. She will go home in a week, where my brothers will help her do what used to be the simplest things, and roam Louisville for her, tracking down libraries with stories she has not yet read. Good stuff. Steve speaks highly of you and I am happy to have read some of your thoughts on your mom. Writing talent seems to run rampant in your family, but like all skilled storytellers, your brother leaves the reader drooling for more…As I learn more about each you…the Snedekers and their kin never cease to amaze! Ah, The Paducah Sun Democrat…from a time when newspapers were important.